ALMA’s Long Baseline Campaign has produced a spectacular image of a distant galaxy being gravitationally lensed. The image shows a magnified view of the galaxy’s star-forming regions, the likes of which have never been seen before at this level of detail in a galaxy so remote. The new observations are far sharper than those made using the NASA/ESA Hubble Space Telescope, and reveal star-forming clumps in the galaxy equivalent to giant versions of the Orion Nebula in the Milky Way. ALMA’s Long Baseline Campaign has produced some amazing observations, and gathered unprecedentedly detailed information about the inhabitants of the near and distant Universe. Observations made at the end of 2014 as part of the campaign targeted a distant galaxy called HATLAS J090311.6+003906, otherwise known as SDP.81. 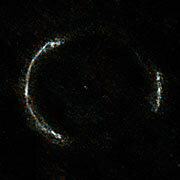 This light from this galaxy is a victim of a cosmic effect known as gravitational lensing. A large galaxy sitting between SDP.81 and ALMA  is acting as a lens, warping and magnifying the view of a more distant galaxy and creating a near-perfect example of a phenomenon known as an Einstein Ring . At least seven groups of scientists  have independently analysed the ALMA data on SDP.81. This flurry of research papers has revealed unprecedented information about the galaxy, including details about its structure, contents, motion, and other physical characteristics. ALMA acts as an interferometer. Simply speaking, the array’s multiple antennas work in perfect synchrony to collect light as an enormous virtual telescope . 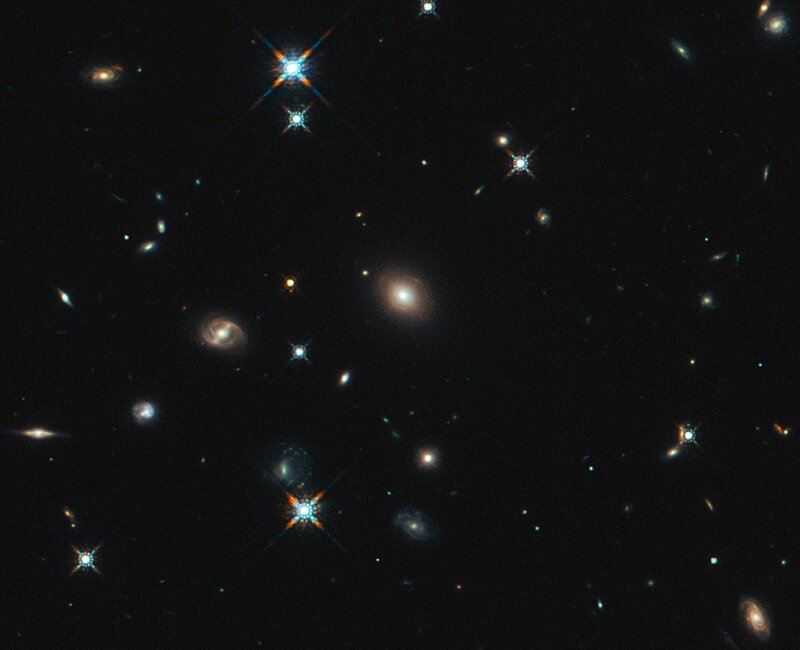 As a result, these new images of SDP.81 have a resolution up to six times higher  than those taken in the infrared with the NASA/ESA Hubble Space Telescope. The astronomers’ sophisticated models reveal fine, never-before-seen structure within SDP.81, in the form of dusty clouds thought to be giant repositories of cold molecular gas — the birthplaces of stars and planets. These models were able to correct for the distortion produced by the magnifying gravitational lens. As a result, the ALMA observations are so sharp that researchers can see clumps of star formation in the galaxy down to a size of about 200 light-years, equivalent to observing giant versions of the Orion Nebula producing thousands of times more new stars at the far side of the Universe. This is the first time this phenomenon has been seen at such an enormous distance. Using the spectral information gathered by ALMA, astronomers also measured how the distant galaxy rotates, and estimated its mass. The data showed that the gas in this galaxy is unstable; clumps of it are collapsing inwards, and will likely turn into new giant star-forming regions in the future. Notably, the modeling of the lensing effect also indicates the existence of a supermassive black hole at the centre of the foreground galaxy lens . The central part of SDP.81 is too faint to be detected, leading to the conclusion that the foreground galaxy holds a supermassive black hole with more than 200–300 million times the mass of the Sun. The number of papers published using this single ALMA dataset demonstrates the excitement generated by the potential of the array’s high resolution and light-gathering power. It also shows how ALMA will enable astronomers to make more discoveries in the years to come, also uncovering yet more questions about the nature of distant galaxies. The lensed galaxy is seen at a time when the Universe was only 15 percent of its current age, just 2.4 billion years after Big Bang. The light has taken over twice the age of the Earth to reach us (11.4 billion years), detouring along the way around a massive foreground galaxy that is comparatively close at four billion light-years away from us. Gravitational lenses were predicted by Albert Einstein as part of his theory of general relativity. His theory tells us that objects bend space and time. Any light approaching this curved space-time will itself follow the curvatures created by the object. This enables particularly massive objects — huge galaxies and galaxy clusters — to act as cosmic magnifying glasses. An Einstein ring is a special type of gravitational lens, in which the Earth, the foreground lensing galaxy, and the background lensed galaxy are in perfect alignment, creating a harmonious distortion in the form of a ring of light. This phenomenon is illustrated in Video A.
 ALMA’s ability to see the finest detail is achieved when the antennas are at their greatest separation, up to 15 kilometres apart. 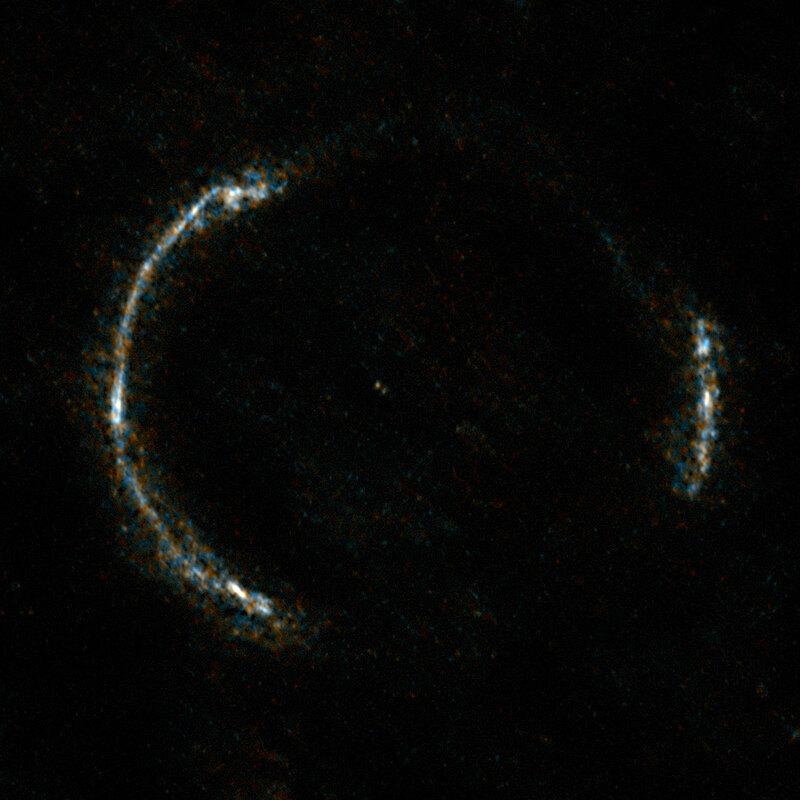 For comparison, earlier observations of gravitational lenses made with ALMA in a more compact configuration, with a separation of only around 500 metres, can be seen here. Details down to 0.023 arc-seconds, or 23 milli-arcseconds, can be measured in these data. Hubble observed this galaxy in the near-infrared, with a resolution of about 0.16 arc-seconds. Note, however, that when observing at shorter wavelengths, Hubble can reach finer resolutions, down to 0.022 arcseconds in the near-ultraviolet. ALMA’s resolution can be adjusted depending on the type of observations by moving the antennas further apart or closer together. For these observations, the widest separation was used, resulting in the finest resolution possible. 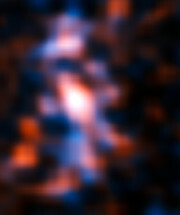 The high-resolution ALMA image enables researchers to look for the central part of the background galaxy, which is expected to appear at the centre of the Einstein ring. If the foreground galaxy has a supermassive black hole at the centre, the central image becomes fainter. The faintness of the central image indicates how massive the black hole in the foreground galaxy is. This research was presented in eight papers to appear in the near future. The science teams are listed below. Yoichi Tamura (The University of Tokyo), Masamune Oguri (The University of Tokyo), Daisuke Iono (National Astronomical Observatory of Japan/SOKENDAI), Bunyo Hatsukade (National Astronomical Observatory of Japan), Yuichi Matsuda (National Astronomical Observatory of Japan/SOKENDAI), and Masao Hayashi (National Astronomical Observatory of Japan). Simon Dye (University of Nottingham), Cristina Furlanetto (University of Nottingham; CAPES Foundation, Ministry of Education of Brazil, Brazil), Mark Swinbank (Durham University), Catherine Vlahakis (Joint ALMA Observatory, Chile; ESO, Chile), James Nightingale (University of Nottingham), Loretta Dunne (University of Canterbury, New Zealand; Institute for Astronomy [IfA], Royal Observatory Edinburgh), Steve Eales (Cardiff University), Ian Smail (Durham), Ivan Oteo-Gomez (IfA, Edinburgh; ESO, Germany), Todd Hunter (National Radio Astronomy Observatory, Charlottesville, Virginia, USA), Mattia Negrello (INAF, Osservatorio Astronomico di Padova, Vicolo Osservatorio, Padova, Italy), Helmut Dannerbauer (Universitat Wien, Vienna, Austria), Rob Ivison (IfA, Edinburgh; ESO, Germany), Raphael Gavazzi (Universite Pierre et Marie Curie, Paris), Asantha Cooray (California Institute of Technology, USA) and Paul van der Werf (Leiden University, The Netherlands). Mark Swinbank (Durham University), Simon Dye (University of Nottingham), James Nightingale (University of Nottingham), Cristina Furlanetto (University of Nottingham; CAPES Foundation, Ministry of Education of Brazil, Brazil), Ian Smail (Durham), Asantha Cooray (California Institute of Technology, USA), Helmut Dannerbauer (Universitat Wien, Vienna, Austria), Loretta Dunne (University of Canterbury, New Zealand; Institute for Astronomy [IfA], Royal Observatory Edinburgh), Steve Eales (Cardiff University), Raphael Gavazzi (Universite Pierre et Marie Curie, Paris), Todd Hunter (National Radio Astronomy Observatory, Charlottesville, Virginia, USA), Rob Ivison (IfA, Edinburgh; ESO, Germany), Mattia Negrello (INAF, Osservatorio Astronomico di Padova, Vicolo Osservatorio, Padova, Italy), Ivan Oteo-Gomez (IfA, Edinburgh; ESO, Germany), Renske Smit (Durham), Paul van der Werf (Leiden University, The Netherlands), and Catherine Vlahakis (Joint ALMA Observatory, Chile; ESO, Chile). ESO is the foremost intergovernmental astronomy organisation in Europe and the world’s most productive ground-based astronomical observatory by far. It is supported by 16 countries: Austria, Belgium, Brazil, the Czech Republic, Denmark, France, Finland, Germany, Italy, the Netherlands, Poland, Portugal, Spain, Sweden, Switzerland and the United Kingdom, along with the host state of Chile. ESO carries out an ambitious programme focused on the design, construction and operation of powerful ground-based observing facilities enabling astronomers to make important scientific discoveries. ESO also plays a leading role in promoting and organising cooperation in astronomical research. ESO operates three unique world-class observing sites in Chile: La Silla, Paranal and Chajnantor. At Paranal, ESO operates the Very Large Telescope, the world’s most advanced visible-light astronomical observatory and two survey telescopes. VISTA works in the infrared and is the world’s largest survey telescope and the VLT Survey Telescope is the largest telescope designed to exclusively survey the skies in visible light. ESO is a major partner in ALMA, the largest astronomical project in existence. And on Cerro Armazones, close to Paranal, ESO is building the 39-metre European Extremely Large Telescope, the E-ELT, which will become “the world’s biggest eye on the sky”. ESO is a major partner in ALMA, the largest astronomical project in existence. And on Cerro Armazones, close to Paranal, ESO is building the 39-metre European Extremely Large Telescope, the E-ELT, which will become “the world’s biggest eye on the sky”.